Laurinda Titus-Luciano and her son Gino pose with some props that will be used at the haunted house in Windward Mall this month. Even before the exhibit is open for business, a few curious children drift over to the space reserved for the Scare Factory III in the Windward Mall. » Haunted House and Fun Fair: Built by the Kaneohe Marines' MCAF Crew, Oct. 21 and 22 at Lanikai School, 140 Alala Road. Haunted House, 6 to 10 p.m. Admission is $3 for keiki under 15 and seniors and $5 for adults. Fun fair with a bounce house, cake walk, dunking booth, 5 to 9 p.m. Call Janet at 779-7400. » Manana Haunted House: 6:30 p.m. Oct. 28 and 29 at Manana Community Park. Call Cass at 453-7527. Drawn to the fluorescent sign announcing its arrival, more than one pair of young, brave souls hesitantly puts a foot under the half-open gate before pulling back and scattering off in different directions. They probably changed their minds about getting a sneak peek at the creepy-crawly things that go bump in the night. The sound of an electric saw buzzing in the background didn't help embolden them either. But beyond the entry way, out of view, the haunted house is occupied by three mild-mannered workers -- Laurinda Titus-Luciano, and Lance and Keith Johnson -- busy readying the 10-room house four days before its debut this weekend. While Titus-Luciano tells her story while mixing up another batch of cement, her knees are shaking and chicken skin is popping up on her arms. Though it's the third haunted house she and her son Gino have painstakingly put together at the mall for Halloween (one of their favorite holidays), she still gets an attack of the jitters because of the anticipation. Titus-Luciano, who is also a professional clown, says "If you don't feel anything, you're not really connected to what you are doing." The owner of Barnaby Circus and the now-closed costume shop Spooky's Halloween Town and her son take pride in their scaring skills. The haunted house is the result of their imaginations and the numerous costumes they keep in a 40-foot deep storage locker. If house guests walk away with sweaty palms and a rapid heartbeat, Gino said he's done his job as one of the ghouls, goblins, witches and monsters who will "greet" guests in themed rooms such as the Haunted Forest, the Bone Garden and Satan's Lair. 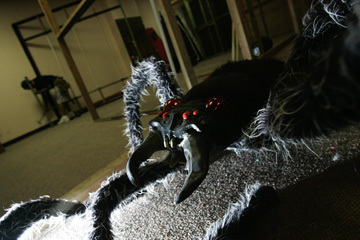 A giant spider sits on the floor of the haunted house in Windward Mall which is still under construction. "If I scared someone, then I feel I accomplished something," said the Castle High School senior. "It's something nice for the community; something fun to do and see. We get positive feedback. It's just so much fun. I get asked at different times of the year, 'Is your mom doing a haunted house this year?' "
Scares will be offered in two fright levels at the haunted house. For those who can take it, the works will be pulled out, as a motorized marionette, ghouls and goblins will leap out and swarm visitors at unexpected times. For the meek and mild, and youngsters, they'll just get a walkthrough of the house. After taking a year off, Titus-Luciano said this year's haunted house is in honor of her late parents, Doris and Reg Titus. Titus-Luciano and her son also got some help in putting together the Scare Factory from longtime family friends Lance and Sonja Kaau. Lance bring his carpentry skills to the project, and his wife works for Titus-Luciano's tamer business, Absolutely Awesome Home and Business Cleaning Business of Hawaii. The Titus-Luciano's love for the holiday was even evident at their Kaneohe home for many years. It was a once-a-year spectacle with spider webs draped across doorways, plastic body parts on the front lawn, paper skeletons stapled to walls and hallways lit up with strobe lights. "Halloween is fun," Titus Luciano said. "This is just for the fun and thrill of it. I look at Halloween as the grand opening of the holiday season." A corpse lies in a coffin of the haunted house in Windward Mall.